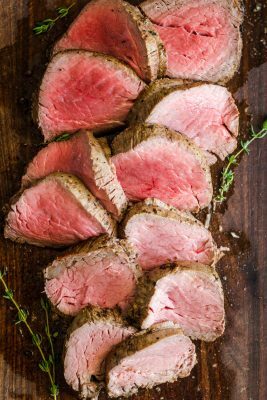 A garlic and herb crusted beef tenderloin with an easy, tried and true roasting method. No marinating required and for melt-in-your-mouth tender and flavorful beef. Remove tenderloin from refrigerator 1 hour before roasting. Trim and tie beef tenderloin. Preheat Oven to 500˚F with a rack in center. Coarsely chop 2 garlic cloves then strip 1/2 Tbsp of fresh thyme leaves and 1 Tbsp of fresh rosemary. Finely mince together the garlic and herbs. Transfer them to a small mixing bowl. Add 2 Tbsp butter, 1 Tbsp horseradish, 1 1/2 tsp salt and 1 tsp black pepper. Use a fork and mash to combine. Pat tenderloin dry with paper towel and spread the garlic herb rub evenly all over the tenderloin and transfer to a roasting pan or oven safe skillet. Insert an oven-safe meat thermometer into the thickest portion of your tenderloin and roast in a preheated oven at 500˚F for 28-30 min for medium doneness (140-145˚F). Remove from oven and transfer to cutting board, tent loosely with foil and rest 10 minutes. Slice into 1/2” thick slices, and serve right away. 28-30 min for medium doneness (138-140˚F) - what we aim for. 30-32 min for medium-well doneness (140-145˚F) - USDA recommends 145˚F. *Timings can vary depending on your oven and the thickness of your tenderloin, so always check for desired doneness using an oven-safe meat thermometer.